20 Mart 2019 Çarşamba 03:04 - 4 reads. they come from the same Clan: the hard-to-rich Kuwaiti monarch family. Behind them is impressive careers. One of them was the Prime Minister of his country, the other a man of power in the international sport world with mandates in the Executive Board of the world football Association Fifa and the International Olympic Committee. But the Cousins Sheikh Nasser Mohammed al-Ahmed al-Jaber al-Sabah, and Sheikh Ahmad Fahad al-Ahmad al-Sabah want to more. You are waging a fierce struggle for power, to your almost 90-year-old uncle, the Emir of Kuwait, as a state. Now they have a duel before the Geneva justice. Nearly two dozen Geneva lawyers involved in the affair of the state. the conflict between The sheikhs escalated in 2013. Sheikh Ahmad stepped in front of the Kuwaiti Parliament, and said he has Video and audio recordings, the Sheikh Nasser at a Meeting with high-ranking Iranians and the bankers showed. Nasser should have talked with his guests about a coup d'état against the Emir of Kuwait, billions of financial transactions with Israel, and money laundering. There is some evidence that the recordings were made in Nasser's property in Trélex VD, of an Unknown, clandestine, possibly with a ball-point pen hidden camera. This is true, this would be considered an offence in Switzerland. For Sheikh Nasser, the accusation was a further blow to the neck. In 2011, he had to because of corruption allegations, as Prime Minister, to resign. Ahmad increased the pressure on his Cousin. He sued him in 2014 at the Kuwaiti Prosecutor's office and was also in Geneva, in parallel. in Order to give the recordings more weight, Ahmad a special Trick. He staged in Geneva, a so-called private arbitration. This is a private court, consisting of a lawyer, shall adopt an arbitral award, the parties are usually legally binding. That was a Special approach to Sheikh Ahmad's, that he introduced the parties to the conflict themselves. His Geneva lawyer, Matthew Parish is a party to the dispute, the other a Ukrainian company, which was in the possession of Ahmad's closest member of staff. They did so, as if they were in a Clinch, and appointed another Geneva lawyer as a referee. It, you provided three expert reports, which assumed that the recordings are real. The referee confirmed this. However, the Kuwaiti Prosecutor's office decided otherwise. You saw in the footage, a fake, and presented their criminal case against Nasser. Now the Wind turned. Sheikh Ahmad is forced to apologize in the Kuwaiti television in his Cousin, Nasser. Wet the apology was too little. In 2015, he filed in the case of the Geneva public Prosecutor's office a criminal complaint against persons unknown for forgery. "These machinations, the influence on the public opinion in Kuwait, have their origin in Geneva," wrote his lawyers in the lawsuit. Nasser accused his Cousin Ahmed and his attorneys to have the arbitration proceedings are bogus. "The allegations against our client were so severe that he can be punished with death, would have been if they had applied", outraged Nasser's lawyers. The Geneva justice responded. Prosecutor Stéphane Grodecki opened a criminal case and the office of Ahmad's left browse Geneva lawyers. He wanted to check the shots and caught up with the forensic Institute of the Canton and city of Zurich police Department and at the Institute for computer linguistics expert opinion. According to the Zurich-based experts, the picture and sound were dealt a massive turn off. However, in order to verify their authenticity, you would have to compare the Videos with the original material or a copy of it. The original material wants to officially have but no more. Even Sheikh Ahmad's closest colleague does not, according to its own information, the Videos on a USB-Stick, 2013, in Geneva, Hotel Four Seasons from an informant got and immediately to Kuwait, to borrow the Material to the Prime Minister. Sheikh Nasser stressed, in the criminal proceedings: "The accusations of money laundering and which have been constructed evasion of Billions in all." In his interrogation he said: The goal of his Cousins had been, him as the successor of the Emir to turn off, as well as the allegations of corruption in a purely politically motivated. The justice in his home country have him exonerated of all charges. Now, Nasser is hoping that the Geneva justice is his Cousin Ahmad in the barriers. For this, the ongoing criminal proceedings already has serious consequences. At the end of last year, he suspended his activities to the Olympic Committee until further notice. From the Fifa's Executive Council, he had withdrawn in 2017. The Kuwaiti Sheikh Nasser Mohammed of the University of Geneva in 2017, over a Million francs. The money flowed to a chair for the hydro policy of Unesco, as well as a scholarship Fund for a student exchange between the universities in Geneva and Kuwait. Sheikh Nasser likes to stress that he had studied in the 60s at this University. More precisely, at the faculty of Economics and social Sciences. The University says it is on request, you could not confirm that the Sheikh, in Geneva, made a conclusion. "In the first half of the 1960s, not all of the acquired accounts have been registered," the spokesman Gérard Cattaneo. In addition, one cannot exclude the possibility that he studied for reasons of confidentiality and security under a false name. 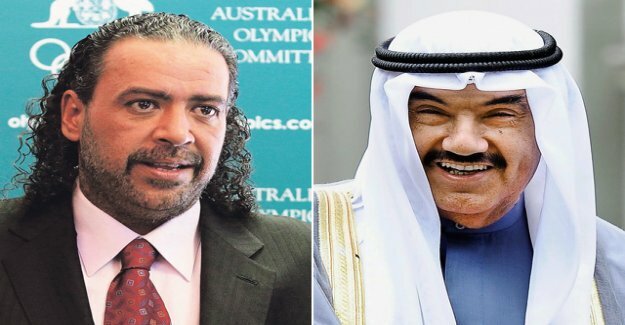 The million donation was also in the criminal investigation of a topic, the results of the Geneva public Prosecutor's office in connection with the dispute between Sheikh Nasser and his Cousin. Firstly, because the investigating Prosecutor Stéphane Grodecki at the University of Geneva has a teaching job. On the other, because it is unclear whether the University has checked the origin of the money, Sheikh Nasser, a so-called politically exposed Person (PEP). As a lawyer at a hearing, the interweaving of Grodecki with the University spoke, intervened Grodecki; do this with the criminal investigation. Sheikh Nasser pointed out, in turn, his study time, and stressed that the University had organized after the donation celebrations in his honor and give him a medal. On the question of a lawyer, whether the University questioned him about the origin of the money, said the Sheikh, he knew that it was a humanitarian project. University spokesman Cattaneo says, the donors would be reviewed in a two-stage process on the basis of the criteria of a Fundraising Charter. This includes investigations on the origin of the assets module from time to time. At the end of the Bank, which transfer the monetary donation to the account of the University's control, the donor. Apparently, no one raised concerns. The Geneva city Council and the national Council Guillaume Barazzone (CVP) traveled in October 2017, after Kuwait, to thank Sheikh Nasser personally for the million donation. His journey had a sequel, because Barazzone the city allocated about 7000 francs for the six-day trip, although to him the Nights were offered. Geneva mayor Sami Kanaan said: This trip would not have been necessary. Had thanked the University in the case of Sheikh Nasser with the Festival, and a medal.